Today's printable is for the math learners. 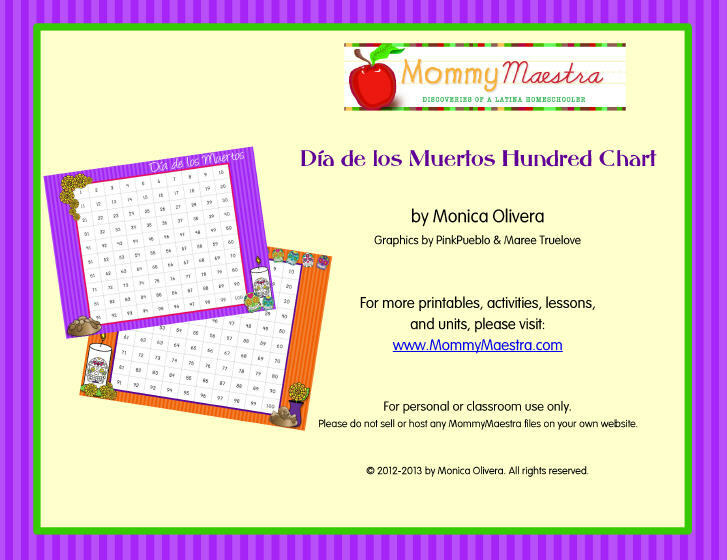 This download includes two different Día de los Muertos themed hundred charts to help elementary students learn their numbers, and counting by 1's, 2's, 5's, 10's, odds and evens, etc. I use the hundred chart with my first grader, but it is good for students in PreK through 3rd grade. Hundred charts are used heavily with Saxon Math, but the chart is pretty boring, so if you would like a fun one, consider these. Remember, this printable is free for download until midnight EST tonight! 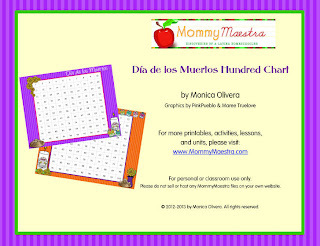 After that you can find it and other MommyMaestra printables in my TpT store.